"Blessed and cursed with super-human abilities, the ranks of mutantkind are constantly growing, constantly expanding. An apprehensive world holds them at arms' length, wary and suspicious of the unknown. An uncomfortable air of mistrust clouds their dealings with normal men, and an even more sinister air of hatred hangs over the dark places in men's hearts. Only through understanding can humanity pierce this murky veil that separates men from mutants. Knowledge drives away the fear of the unknown. 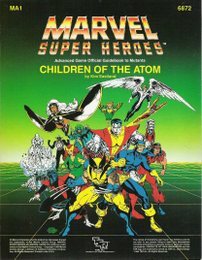 And so, TSR proudly presents Children of the Atom, the complete, up-to-date guidebook to homo sapiens superior. From Acanti to Wolverine, from the Alliance of Evil to the X-Men, every significant mutant and mutant group known is described in detail. A bonus short adventure, Dreamchild, is also included. The most far-reaching revolution in history is taking place in our genes. To survive, we must understand the children of the atom. Children of the Atom consists of a 96-page roster book and a 10 1/2" x 15" pull-out map. This game accessory is designed for use with the MARVEL SUPER HEROES™ Advanced Set." "Earth's Mightiest Heroes™ — only the Avengers can lay claim to that proud title. They have fought the deadliest villains ever to imperil the Earth, and their adventures have spanned the limits of the Marvel Universe™. Avengers Coast-to-Coast is a sourcebook that enables you to create grand new adventures for the Avengers, or to relive their great adventures of the past. New exciting information abounds within. The Avengers Charter, detailed descriptions of both mansions and their formidable defenses, new information on security clearances and procedure, full details of the amazing Quinjets™ are included. 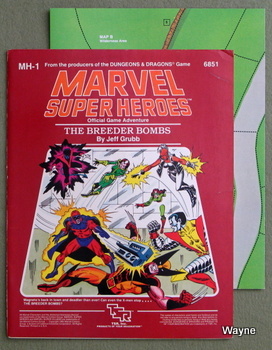 The roster section includes the Avengers not in the MARVEL SUPER HEROES™ Advanced Set (plus some updates), their allies, such as Captain Mar-Veil™ Mentor™, and Firebird™, and a host of villains. These unsavory types include your old favorites, like Kang™, Ultron™, and all the Masters of Evil™ (with more than ever on each), as well as new ones, such as Thanos™, the Squadron Sinister™, and the deadly Scourge™. A 24-page adventure allows you to set up your own player characters as an Avengers expansion team! It's greatness, as only Marvel Comics and TSR can do it! This game accessory is designed for use with the MARVEL SUPER HEROES™ Advanced Set. It is a 96-page book, with expanded information on the Avengers, a 24-page adventure, and a roster of Avengers and their foes." "Two-hundred and ninety-three powers times five ranges times eighteen power levels equals — 26,370 discrete powers! Within these covers are nearly 300 powers, gleaned from your favorite comics, science fiction and fantasy novels, and dozens of other sources. All are detailed in MARVEL SUPER HEROES Advanced Set terms. From Energy Emission to Mental Control, from Energy Doppelgangers to Forced Reincarnation, the powers you've been waiting for are here. A new kind of character generation system (to use or not, the choice is yours) has been created, enabling you to do even more than before. New tables for ranges and movements have also been set up, to take into account the staggering proportions of these powers. Now, whether you dream of creating a CPA or the BEYONDER, here's the book that'll help you do it. This game accessory is designed for use with the MARVEL SUPER HEROES Advanced Set." "Over 25 years ago, Stan Lee and Jack Kirby gave us the FANTASTIC FOUR™, and comic book history was forever changed! Through the years, we have been introduced to the uncanny INHUMANS™, the wondrous inhabitants of ATLANTIS™, the hunger of GALACTUS™, and the awesome powers of HERBIE™, all in the pages of the Fantastic Four! 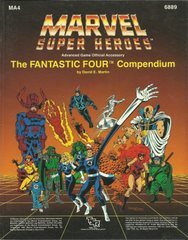 In this book, you'll meet all the heroes who have at one time or another been members of the Fantastic Four, the group's extended family, their friends, and their allies. You'll also find stats for the Fantastic Four's most hated and feared villains: DR. DOOM™ (both of them! ), the PUPPET MASTER™, the members of the FRIGHTFUL FOUR™, and many others. Details are provided for the old Baxter Building and the new Four Freedoms Plaza, for such locales as Project: PEGASUS™, ILIAKANDA™, and HANDAR™. From the Fantastic Four's first battles with GORMUU™ and the MOLE MAN™ to their latest adventures, you can find everything you need to play the Greatest Superhero Team Ever between these covers." "It takes a desperate man to attack the X-Men single-handed, but revenge for a murdered partner makes a man desperate. Did Wolverine really commit murder, or is he being set up? The search for that answer sends the X-Men around the world, and puts them on the trail of their oldest enemy—Magneto, the Mutant Master of Magnetism! And (could it be?) the Original Brotherhood of Evil Mutants! What's Maggie up to this time? And can the Uncanny X-Men stop him? 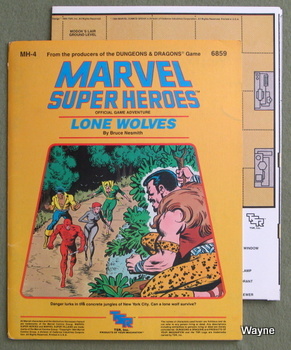 This adventure module is designed for use with the MARVEL SUPER HEROES role-playing game. This package includes a complete, seven-chapter adventure, a two-sided, full color, 22 1/2" x 17" playing map, and detailed information on the X-Men, Professor Xavier, Magneto, and more!" "Immortus brings an awful message from Limbo: Earth is doomed! Solar flares and atomic infernoes will scour the planet in two days! Only the Might Avengers can avert catastrophe, by traveling through time!" "Things have been pretty quiet around the Baxter Building lately... A little too quiet. That's about to change. Somebody wants the Fantastic Four out of the way, permanently. They're paying top dollar to get it done, and when you want the best, you want Arcade. He doesn't just do a nasty job with style -- he enjoys it!" "New York City is a jungle. A concrete jungle. And at night the jungle's creatures come out. Scavengers. Human rats. Scum traveling in packs, preying on the slow and weak. But the packs are hunted, too — by wolves. Lone wolves. SUPER HEROES who patrol the jungle paths alone. You can become Daredevil, the Man Without Fear. Or the beautiful but deadly Black Widow. Or one of the Heroes for Hire, Power Man or Iron Fist. This adventure includes a 16-page adventure book, a large, full-color map, and complete information on Daredevil, Black Widow, Power Man, Iron Fist, and their foes in this adventure." "There's a government agent from Ottawa who looks like he's been attacked by a lawnmower. There's a house in Ontario haunted by a ghostly widow and her ghastly cats. There's a power project in Quebec plagued by a certain jade-jawed giant. There's a madman at the Arctic Circle working to free an ancient power. And there's only one super-team to solve the mystery -- Alpha Flight. But can even they handle what lies ahead?" "The treacherous Loki plans to usurp the throne of eternal Asgard -- and he's stolen the weapon that can stop him! The mighty Thor must brave the dangers of the giant-realm and smash this sinister plot! This is a special replayable solo adventure for the MARVEL SUPER HEROES™ Game, using the MAGIC VIEWER™ screen. 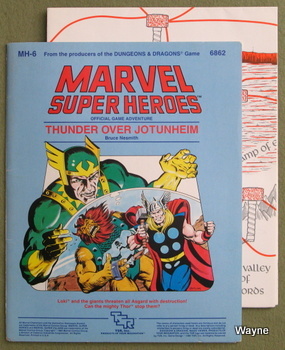 It includes a 16-page adventure book, a large two-color map, the MAGIC VIEWER™ screen, and complete information on Thor and his fearsome opponents." "The WEST COAST AVENGERS are off for a vacation in the Rockies where they can get away from the everyday grind of fighting villains and would-be world conquerors. Or are they? When HAWKEYE, MOCKINGBIRD, TIGRA, and WONDER MAN arrive they are met by Rick Jones, honorary Avenger, who has grave news. His scout troop has disappeared ... along with the invincible IRON MAN! Can the remaining members of the WEST COAST AVENGERS find the missing kids and the world's greatest human fighting machine? And once found, can they be freed from the clutches of the mysterious Mr. Chu? There's mystery, the thrill of the hunt, and non-stop slugfest action when America's newest super-team faces a bevy of baddies at The Last Resort. 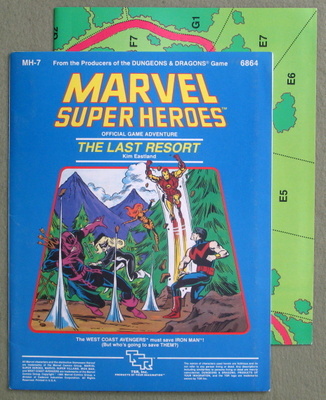 This adventure is for use with the MARVEL SUPER HEROES Role-Playing Game. 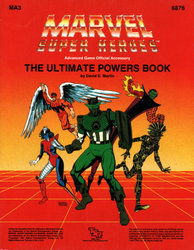 You must have the MARVEL SUPER HEROES Role-Playing Game to play this adventure. 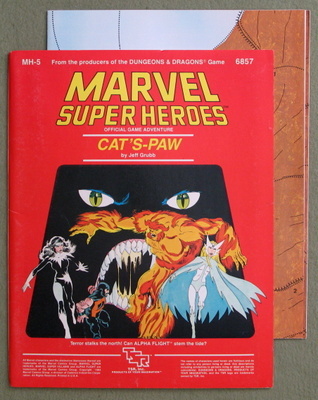 This package includes a 16-page adventure book, 21 1/2"x33" color map, 8 character cards, and complete information on the WEST COAST AVENGERS and their fearsome foes." "They are the last words of a dying man. "Fault..-Line." What do they mean? How does It threaten New York? Who would kill to keep it a secret? Is there a rupture in the foundation under the Big Apple, or is there another meaning lurking in the cryptic confession? Can SPIDER-MAN, CAPTAIN AMERICA, the WASP, and the BLACK KNIGHT save the city from certain destruction? Can the heroes solve the mystery, find the villain behind the evil plot, and beat the clock before the mighty metropolis runs out of time? 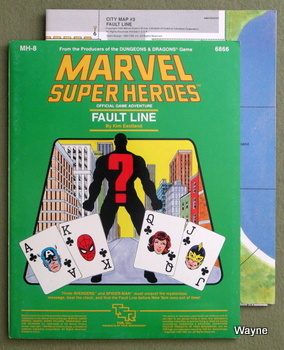 FAULT LINE is an adventure for use with the MARVEL SUPER HEROES Role-Playing Game. You must have the MARVEL SUPER HEROES Role-Playing Game to play this adventure. This package includes a 16-page adventure book, a full-color City Map, and more than a dozen ADVENTURE FOLD-UP Figures." "You are in a world where REED RICHARDS did not live to become MISTER FANTASTIC! BEN GRIMM is the THING, but he's not rocky and orange — he's wearing a power suit! And wait just one minute — you say that VICTOR VON DOOM is a HERO? You have passed through of the Gates of What If — into a divergent universe, where things are almost the same, with a few changes. VICTOR has plans — and you're invited. GATES OF WHAT IF? 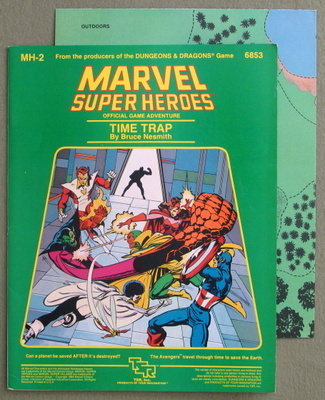 is an adventure for use with the MARVEL SUPER HEROES role-playing game. 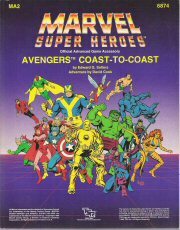 You must have the MARVEL SUPER HEROES role-playing game to play this adventure. This package includes a 40-page adventure book and a full-color map of DOOMSTADT and other areas." "A mysterious summons drew Earth's greatest heroes to an alien device in Central Park. The device took them to the end of the universe, to hear the command of the mysterious Beyonder, "Slay your enemies and all you desire shall be yours." On a strange planet created for the battle, the heroes must fight for their lives against a host of villains led by the the fearsome Doctor Doom. The destiny of the entire Earth will be decided in the SECRET WARS. 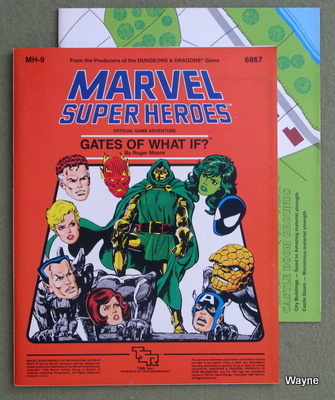 This adventure module for the Marvel Super Heroes role playing game recreates all the titanic action of the Secret Wars Limited Series. 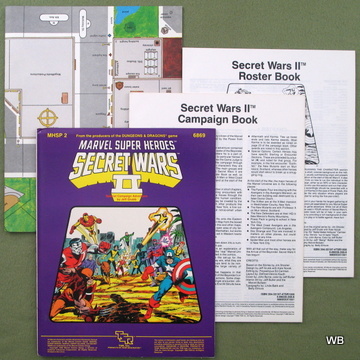 This package includes an adventure covering the entire war, complete information on more than thirty heroes and villains, and a full-color, two-sided playing map." "Men call him the Beyonder — the most powerful known being in this or any other universe. Capable of destroying galaxies at will, of transcending time and space, of defeating death itself, this being has all-too-recently kidnapped the greatest heroes and villains of Earth to fight in his SECRET WARS. Now he's coming to Earth. 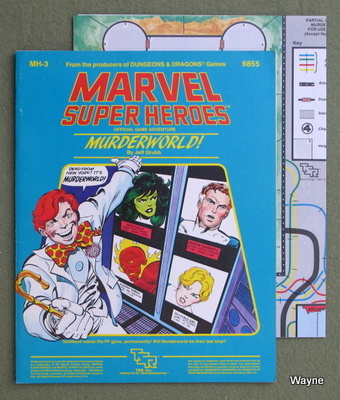 SECRET WARS II chronicles the Beyonder's adventures for the MARVEL SUPER HEROES role-playing game. It encompasses the mighty epic from the Beyonder's arrival to his final battle, and everything that happens in between. The MARVEL UNIVERSE will never be the same! 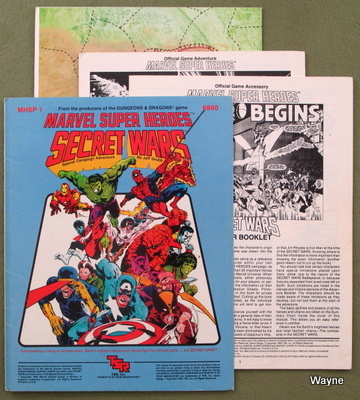 SECRET WARS II includes a 32-page roster book describing the major heroes and villains, a 32-page campaign book brimming with adventure, and a two-sided 21 1/2" by 33" full-color map. This is it! The Beyonder walks the Earth! What is your hero going to do about it?"